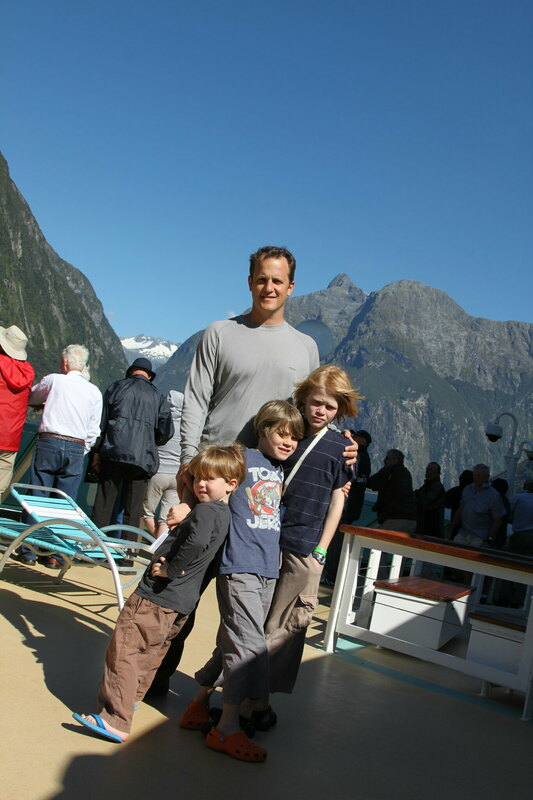 On our last day in New Zealand we didn’t leave the boat. 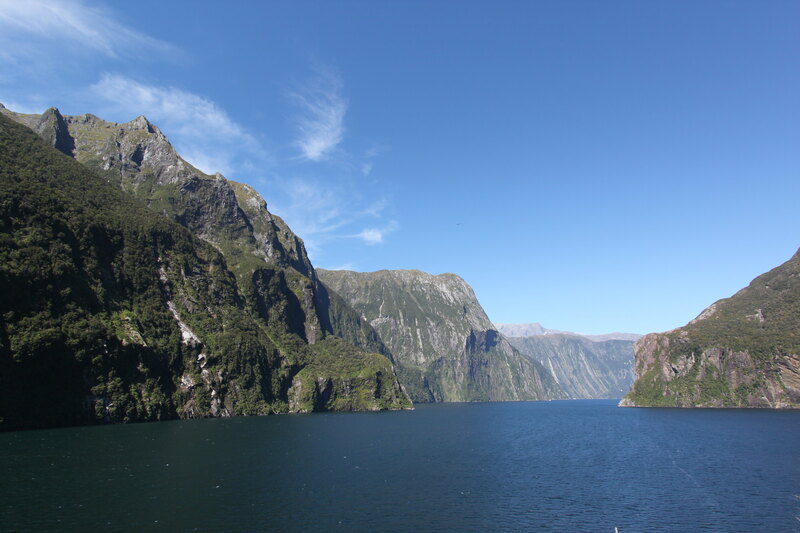 Instead, almost the entire day was spent cruising in and out of the three most famous sounds in Fjord land National Park at the southwest tip of New Zealand (latitude between 45 and 46 degrees south – as far down as I have ever been). I’m told that the Sounds are much like the fjords in Norway and if so then that’s another place I’m going to have to make it to because they are simply stunning. 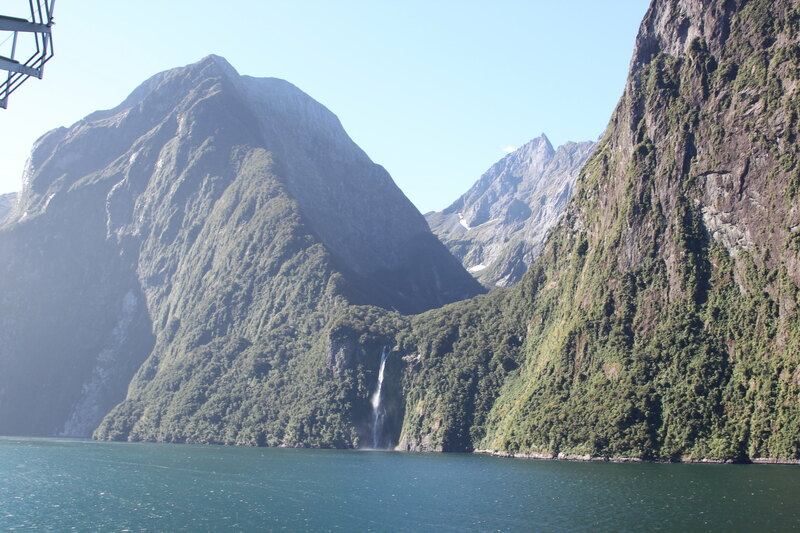 First we went though Dusky Sound, then Doubtful and finally culminated with the amazing Milford Sound from 4-6 pm. Each sound was more impressive than the next and Milford was unlike anything that I had ever seen before. Huge cliffs that rose straight up out of either side of a narrow 10-mile strip of water, culminating in snow capped peaks 5,000 feet above us. 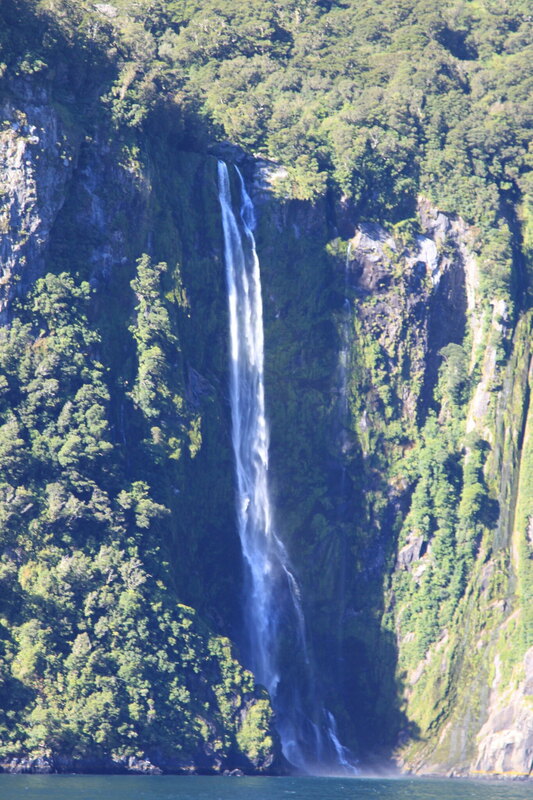 Glistening waterfalls poured gently down the sides creating a fine mist before hitting the ocean far below. It was just spectacular and I couldn’t take my eyes off the scene as it unfolded in front of me. Definitely the climax of our trip to New Zealand, for me, and I’m happy that it was my last impression of that beautiful country. I hesitate to post my pictures because they simply cannot do justice to that magical place but I would be remiss if I did not try at least to give a flavor of what we saw. Our final port on our New Zealand adventure was the former gold town, and largest city, Dunedin. The morning started out poorly when I got off the ship to look for our rental car only to find it wasn’t there (apparently I hadn’t read the confirmation email clearly enough and there was another step involved). Luckily for about the same price, I was able to find a private guide with a mini-van waiting at the port and hired her for the day. Our first stop was the Royal Albatross Colony to try to catch site of the largest flighted birds in the world. The tour and viewing was just an hour and while it was good introduction to the magnificent birds we didn’t actually get to see one flying. Still a worthwhile experience. 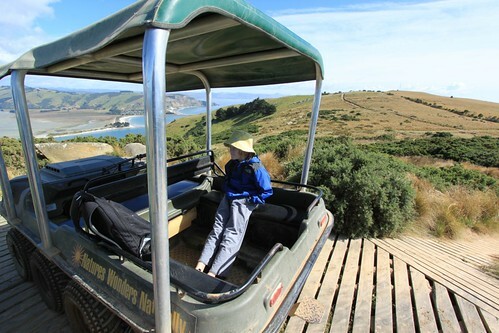 Our next stop was Natures Wonders Naturally, which is a privately owned wildlife sanctuary at the tip of the Otago Peninsula. I had reserved our tour three weeks prior and when we arrived I walked up to the desk and said that we had reservations for a 10:45 tour. The man behind the desk, who turned out to be the owner Perry, responded sarcastically “not here you don’t”. My heart sank. Had I messed up again? Did I mix up the dates? I was about to pull out my computer and show him my confirmation email when he took another look at his schedule and realized that we did in fact have a reservation. He then explained that all of his guides had left on other tours (some mix up with the cruise ship buses) and he would have to take us himself. “Great!” I thought thinking who better to show us around the property than the owner himself. Boy was I mistaken! Perry turned out to be one of the more egotistical and obnoxious people that I have had the displeasure of meeting. He kept telling us how his property was the best thing that we had ever seen (at least 10 times). At every stop along our route, on the noisy stinky but capable 8 wheel drive Argos, instead of giving us information about what we were seeing he just kept telling us how great it was. To top it all off he kept telling the kids (who were actually being perfectly well behaved for once) to be quiet and barking at them if they made a sound (the whole while he was practically yelling at us). 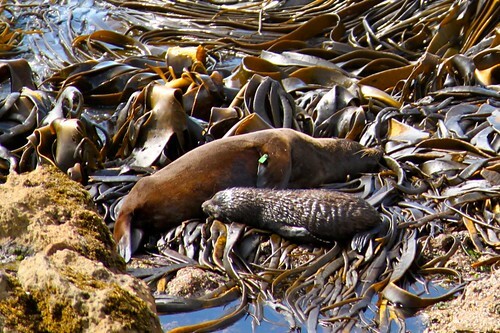 It really was a stunning beautiful property and we saw some very amazing wildlife (seal pups frolicking in the surf, yellow eyed penguins and their babies, etc) but the experience was deeply marred by this truly arrogant man. 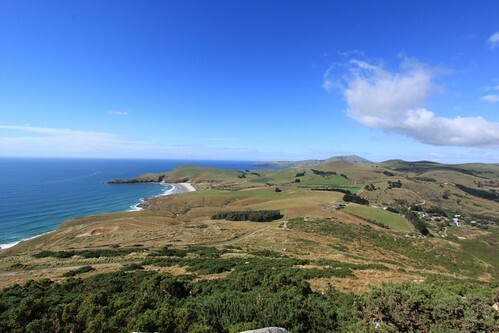 On our way back from Natures Wonders we took the “high road” back to Dunedin, which took us along the top of the peninsula with amazing views of the ocean from both sides. I kept wanting to stop and enjoy the view but was overruled by the rest of the van. I did manage to snap a few great shots to remember the experience by. After driving up, and back down, the steepest street in the world (Baldwin Street) we headed over to a tour of the Cadbury Chocolate factory. 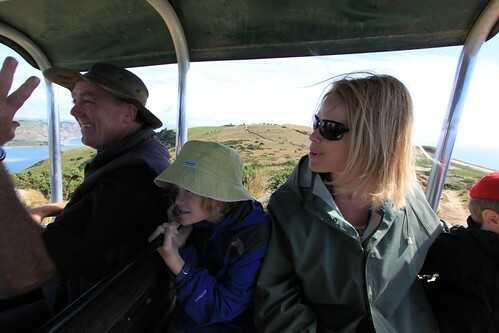 The tour, as we had been pre-warned, was uninspired but the kids loved it. I would imagine that the bag full of free chocolate provided helped to sway them.